The gift economy works in the spirit of paying it forward. You are humbly offered a gift. You may choose to pay forward the gift to someone else. 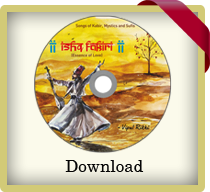 A lot of people have already put in their time, energy, intentions and resources into making Ishq Fakiri possible, and available freely for whoever needs it in whatever form. From the conception in a couple of individuals’ minds and hearts, to the recording studio, to the CD design and production, to an artist sitting on the coast painting a cover picture, to a cyber firm in a big city chalking up this web site which you have visited, a lot of energies have come together to enable this manifestation. All this has been done with bhaav, with feeling. All of this is already a gift, for whoever would like to receive it, wherever they may be. If you would like to offer support in the spirit of participating in this chain, please feel free to do so in any way that you may see fit. It may be by sending your good wishes, by offering to be a host, by spreading the word in your community, by commissioning any number of CDs as gifts, or any other form that we may not have yet imagined. The intention counts for everything, and the necessary forms will appear. If you do feel deeply moved to offer financial support, again there are multiple opportunities. The support may be for the artist, for the inspiration-driven producers, for the CD designer or web design firm, or the community which enabled it. To offer support to Vipul or anyone else in the community, please use the contact form to get in touch. Thank you.